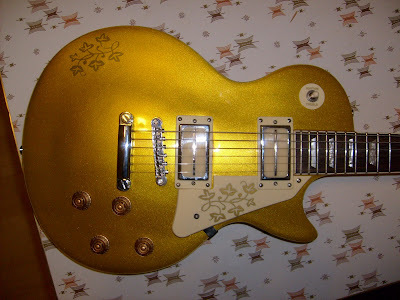 I recently got a gold Les Paul. It's not a gold top--the entire body is gold. It originally had humbuckers but I've replaced them with single coil blade pickups (with AlnicoVI magnets!) from Vintage Vibe Guitars. Peter Biltoft did a great job and I couldn't be happier with these pickups. I wanted something different and these definitely deliver. I plan on adding an arm rest in the near future so I'll post follow up pics when I have them.